NOTE: This potter is not Stoke-on-Trent (Staffordshire) but Stockton-on-Tees, Yorkshire. 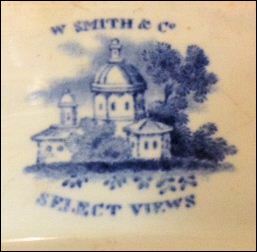 The entry is included because Smith used the name "Wedgwood" (or WEDGEWOOD) to mark his pottery so as imitate the mark of the Josiah Wedgwood company. Smith even called his works "Stafford Pottery" (after Staffordshire - the county where Stoke-on-Trent is situated) and used the name "Queen's Ware" - which Josiah Wedgwood invented. 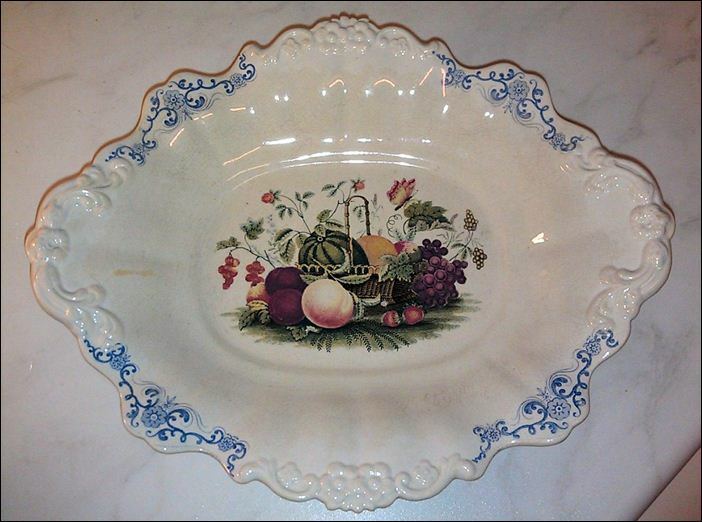 'Fruit Basket' serving plate made by William Smith & Co.
"This impressed mark occurs on an English earthenware plate in the Godden Collection... it was probably made at one of the many Yorkshire potteries, the mark being intended to look like that of Wedgwood but different enough to escape legal action." This mark was used by William Smith & Co. of the Stafford Pottery, Stockton-on-Tees, Yorkshire, and it would therefore seem that this VEDGWOOD mark was used by this firm, who sought to pass off their wares as true Wedgwood. 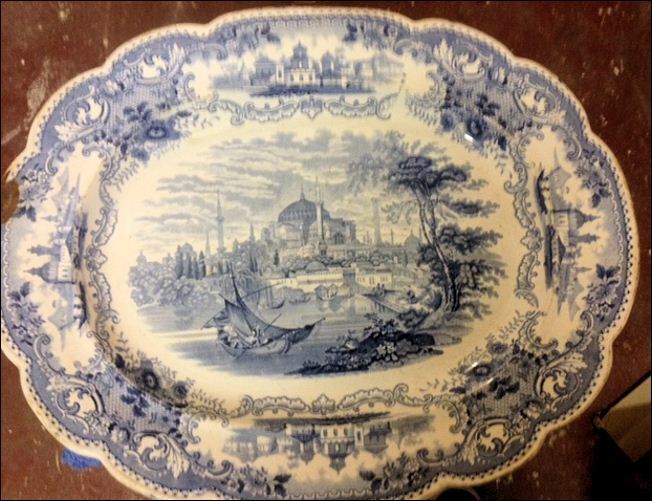 In this case they were successful, for the two plates in the Victoria and Albert Museum were officially described as made by the Staffordshire firm!" Injunction against Messrs. Smith and Co.
"And now, while speaking of marks, a few words may opportunely be introduced on a matter which is somewhat puzzling to collectors, and about which they will doubtless be glad to receive enlightenment. It is this: in many collections pieces of one kind or other will be found bearing the mark WEDGWOOD & Co., and others with the mark of WEDGEWOOD, sometimes impressed, and sometimes in colour. 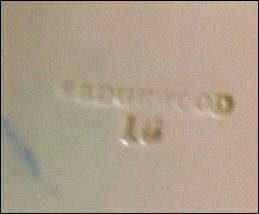 The latter, it will be observed, has a central E, which the real name of Wedgwood does not possess. These I have heard variously appropriated by collectors to Wedgwood and Bentley, to Wedgwood and Byerley, and to a dozen other supposed periods and people. I am enabled to state that these pieces,	many of them highly creditable and excellent productions,	were not made by the Etruria Wedgwoods at all, but that the latter (the "Wedgewood," and sometimes the "Wedg-wood ") were the manufacture of Messrs. William Smith,	and others, of Stockton, against whom Messrs. Wedgwood	applied for and obtained an injunction restraining them from	using the name of "Wedgwood, or " Wedgewood." "Lincoln's Inn, 8th August, 1848. "Wedgwood and others against Smith and others. Durham, under the Firm of 'William Smith and Company'), to	restrain them and every of them, their Agents, Workmen, or Servants, from stamping, or engraving, or marking, or in any way	putting or placing on the ware manufactured by them, the Defendants, the name ' Wedgwood ' or ' Wedgewood,' and, from in any	manner imitating or counterfeiting such name on the Ware manufactured by the Defendants since the month of December, 1846, or hereafter to be manufactured by the Defendants, with the name	'Wedgwood' or 'Wedgewood' stamped, engraved, or otherwise marked or placed thereon. 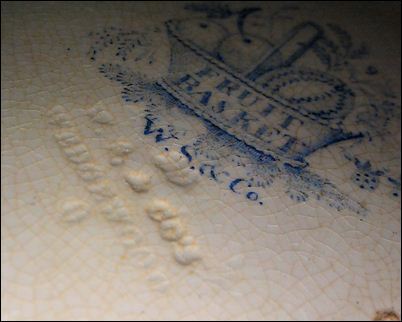 Mr. Bethell stated that the trade mark 'Wedgwood.' had been	used by the family of the Wedgwoods for centuries; he would not,	however, go further into the matter at present, because Mr. Parker	appeared for the Defendants; and it might become necessary – with	whom, and himself, it had been arranged by consent on Mr. Parker's	application on behalf of the Defendants, for time to answer the Plaintiffs' Affidavits – that the Motion should stand over until the	Second Seal in Michaelmas Term next; and that in the meantime	the Defendants should be restrained as above stated. ; except that for the words, 'since the month of December, 1846,' the words, 'since the month of July, 1847,' should be substituted. Mr. J. Parker said he appeared for the Defendants, and consented without prejudice; and on his application for time to answer the Plaintiffs' Affidavits, the Court made an order accordingly. "On the 9th day of November, being the Second Seal in Michaelmas term, 1848, Mr. E. Younge, as counsel for the above-named	Plaintiffs, moved for, and obtained, a perpetual Injunction against	the Defendants in the terms of Mr. Bethell's Motion, substituting	for the words, ' since the month of December, 1846,' the words, 'since the month of July, 1847," the Defendants consenting to pay	to the Plaintiffs their costs.